This charming island is graced with pastel-colored B&Bs, bars, and cafés. The lifestyle is laidback and low key. It’s a perfect spot for those who wish to live on the Caribbean Sea, surrounded by nature… Artists and writers, who seek creative inspiration, will find plenty here, given the spectacular natural environment. There are only three main roads in the village—often referred to as Front Street, Middle Street, and Back Street. The packed sand streets accommodate the primary modes of transport—bicycles, golf carts, and exploration on foot. The majority of visitors arrive by water taxi, from San Pedro or Belize City. Skimming across the Caribbean’s aquamarine waves, you can watch the island’s white-sand shores, fringed with palms, gradually come into view. This approach drives home a reality of life here: On Caye Caulker you feel as if you really are away from it all. And yet, within 20 minutes by plane, or 45 minutes by water taxi, you can be on the mainland. 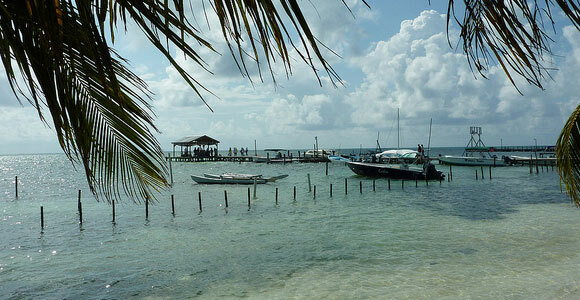 Caye Caulker is known for its quality snorkeling, fishing, and water sports. Thanks to the offshore barrier reef and the wealth of tropical fish, there’s always something to marvel at when exploring the underwater environment. While simply walking along the easterly beach path, lush with leafy sea grape, sea almond, and palm trees, you’ll be delighted by colorful kites billowing above the sea, tethered to avid kite surfers bouncing along the sea’s sparkling surface. 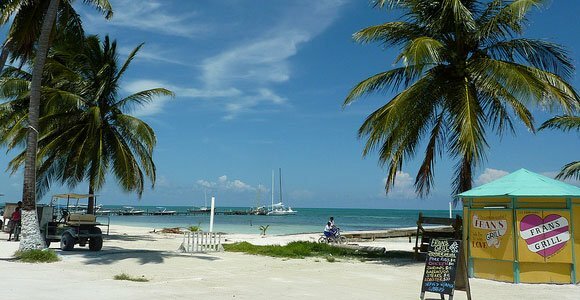 For expats who yearn to retire on an idyllic Caribbean island, Caye Caulker is a dream come true. This island is all about the Caribbean Sea, and its gorgeous natural setting. Caye Caulker offers a kick-back, low-key island lifestyle. Expat retirees who live on Caye Caulker rave about the spectacular surroundings and environment. Most of them are active and enjoy spending time outdoors. They walk along the beach regularly, or bike around the island. Most enjoy swimming, fishing, sailing, or kayaking. And they take advantage of the many opportunities to socialize with their local and expat friends. Expat retirees gather often at several popular hangouts. Their favorite spot is the Barrier Reef Sports Bar and Grill, located near the water taxi terminal. You’ll find an animated group of expats there on Friday afternoons. That’s when the Barrier Reef holds their weekly drop-in jam session. Everyone gathers to enjoy the music and to catch up with friends. During the week the Barrier Reef offers other types of activities that appeal to expats. It’s a great spot to meet expats who live on the island. 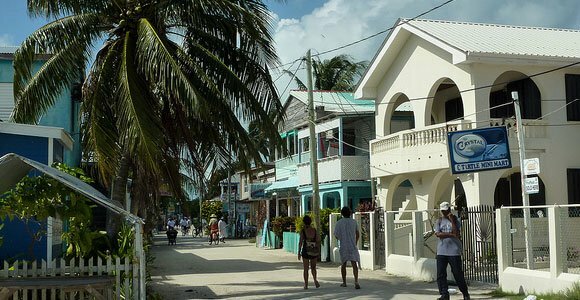 The cost of living on Caye Caulker is still quite reasonable for a popular Caribbean tourism island. But one major saving is that you won’t need a car or golf cart living here. There are strict regulations controlling the number of vehicles on the island. So retirees walk or bike to their destinations, grabbing a taxi when needed. There are plenty of cozy cafés and quirky food kiosks that serve tasty treats at a reasonable price. It’s affordable to meet with friends at a local café for a meal, or a cup of coffee. You can buy fresh fruit and produce, fish, and meat, to cook a good meal. But some retirees prefer to eat many of their meals at local cafés because the price is right. As a retiree you’ll have access to all of the benefits that the government of Belize offers to expats who join the Qualified Retirement Person program. This program allows a retired expat to move all of their personal belongings to Belize without paying duty on them. And QRPs only need to reside in Belize for one month a year to maintain their QRP status. Caye Caulker is quintessential Caribbean, a rare find these days. The island’s lifestyle is simple, laidback, and close to the sea. It’s a desirable spot for expats who enjoy outdoor activities, especially those that are water related. The gorgeous setting provides abundant inspiration for artists, photographers, and writers, as well as those who appreciate nature at its finest. With less than 2,000 residents, Caye Caulker is still small. There’s room to move, with little to no traffic. But the island now has many of the amenities North Americans demand. Most expats who live on the island regularly walk the beach, ride their bikes, and swim in the crystal clear, turquoise sea. There are no cars or trucks, and few golf carts. So the environment is peaceful and slow paced. A favorite pastime of many is to lay in a hammock with a good book, or to indulge in an afternoon catnap. Depending on the season, the number of expats on the island fluctuates between 75 to 500. Many are “snowbirds” that only come for the winter. Those who own homes, B&Bs, or hotels spend a longer period of time on the island. Expats who own a business that demands their attention live there full-time. Caye Caulker’s well located. It’s easy to travel back and forth to Belize City for doctors’ appointments or business errands. You can take a water taxi or a turbo-prop plane. Most residents take the high-speed water taxi for their local trips, priced at $25 (round trip). It takes 45 minutes to get to Belize City, 30 minutes to reach Ambergris Caye. Flights take 15 to 20 minutes, but are pricier, at $80 (round trip) to Belize Municipal Airport. Expats who live here take advantage of all that the Caribbean Sea has to offer. Some are divers, snorkelers, anglers, or sailors. Others just enjoy a daily swim. But a high percentage of the fulltime expats are focused business owners who love working in a relaxed setting. The most common expat-owned businesses on the island are restaurants, bars, art galleries, gift shops, and B&Bs. Expats who own bricks and mortar businesses thrive on the island lifestyle, living near the sea, and interacting with the diverse visitors who come and go. 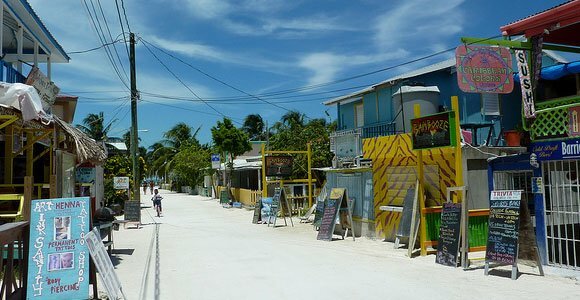 Caye Caulker’s successful business owners are a driven, independent lot. Lee Vanderwalker is one of them. In 2001 she left Michigan behind for the island lifestyle of Caye Caulker. She opened her art gallery, Caribbean Colors, a year later. Over the years she’s moved her gallery four times, adding a café along the way. Lee’s also a professional photographer. Her successful businesses have stood the test of time on the island. While the island of Caye Caulker has kept much of its charm, it has also developed an aura of exclusivity. Expats who fall in love with this island will find few homes and condos for sale, although long-term rentals are hard to come by. The real estate market on Caye Caulker is thin because only 2,000 people live on the island, and the rental market is mainly focused on short-term vacation rentals. Homes and condominiums on the beach are now priced similar to those on Ambergris Caye. For example, a two-bedroom, two-bath, 1000-square-foot condominium in the Seaside Villas complex will likely go for $275,000. Less expensive options do come up at times for expats who are willing to buy off beach, or further away from the village. Flying over Caye Caulker’s north island it’s clear that development is picking up. The north island is separated from the village and south island by the iconic split. The properties on the north island are still well priced. Lots both on the sea and one row from the sea can go for between $50,000 and $100,000. If you were to invest in this type of lot you could build your island dream home for $100 to $175 per square foot. Lots on the main island, south of the local airstrip, can go from $45,000 to $99,500, depending on whether they are on the beach, or just have a sea view. The cost of living on Caye Caulker is surprisingly affordable for a popular Caribbean island. Most expats can live comfortably on this island for $1,500 to $2,000 a month. Caye Caulker offers a simpler lifestyle than its sister island, Ambergris Caye, for a considerably lower price. With a little help from their island friends Diana and Tim found a great rental deal—a furnished two-bedroom off-beach apartment for $650 a month. In order to lock in this price they signed a one-year lease.